I introduced the scenario of building a game leaderboard service, which could provide a central location for storing scores for different games, and allow those games to both store updated scores, as well as retrieve a list of scores for that game. I also showed the basics of the two games I’m planning to use, Catapult Wars, an XNA sample game ported to HTML5 by my fellow technical evangelist Chris Bowen, and Space Cadet, a sample game created by my fellow technical evangelist David Isbitski. In this scenario, I’m going to start with the database, since that’s where the data will need to go. 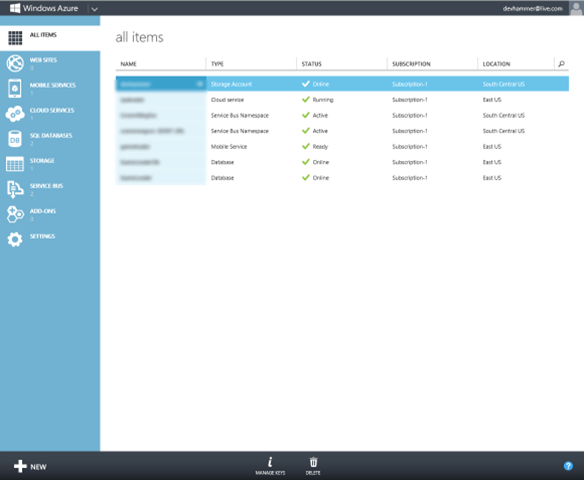 First things first, if you don’t already have a Windows Azure account, you’ll need to create one. If you’re an MSDN subscriber, many MSDN plans include a variety of Azure resources, including compute hours, SQL Azure databases, and more. If you don’t have an MSDN subscription, you can sign up for a 90-day trial that will give you everything you need to follow along, and by default includes a spending cap to ensure that you don’t have any out-of-pocket expenses if your services exceed the trial service limits (if your services exceed the trial limits, they’ll automatically be shut down). Note that in my case, I already have a few services in my account. For a new account, you won’t have any services showing in the management portal when you sign in. Once I’ve filled in all the required fields, I click the CREATE SQL DATABASE link, and the database (and database server, if you’re not using an existing server in your account) will be created and added to the management portal. 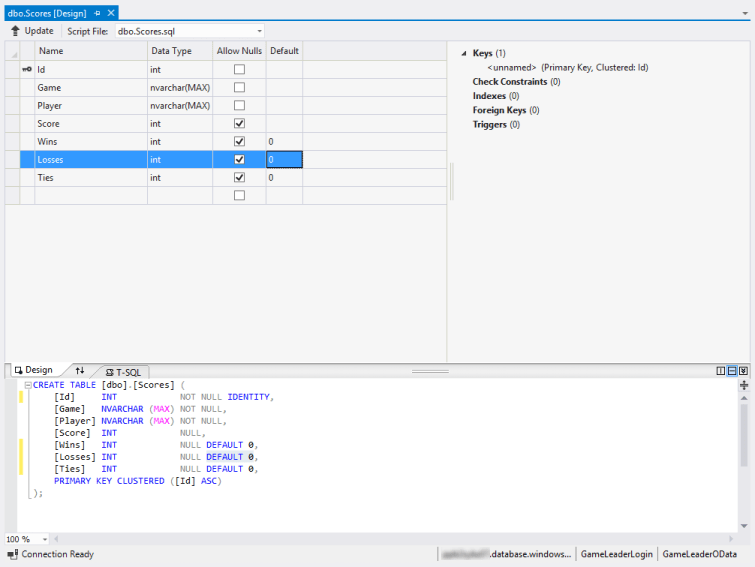 Note the highlighted areas, which include links to show the connection strings (you’ll need those to connect to your SQL Azure DB from Visual Studio), manage the allowed IP addresses (to allow specific IP addresses or ranges to access the database server from outside), and the fully qualified server name of the server instance on which the database has been installed. There’s a lot more I could do in the portal, but that’s outside the scope of this post, so I’ll move on to creating the database schema. To keep this post to the point, I’m not going to go into great depth in terms of creating the data schema. 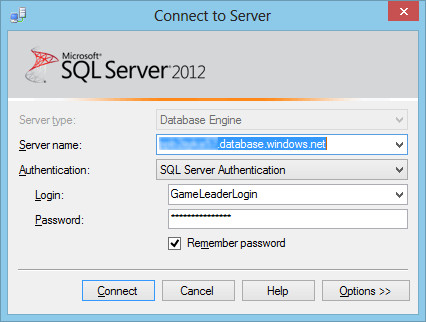 This can be accomplished using SQL Server Management Studio (you’ll want the latest version to connect to SQL Azure), or the SQL Server Object Explorer in Visual Studio 2012 (I ended up using that, since I already have Visual Studio 2012 Ultimate installed, and I don’t have a local copy of SQL Server on this machine). NOTE: If you’re following along, and you get an error message that you can’t connect, you’ll need to go to the Windows Azure portal, and click the “Manage allowed IP addresses” link mentioned above, and add your current client IP address to the allowed list. You can always remove this later, once you’ve deployed your service. As mentioned in my earlier overview post, I’m keeping the schema pretty simple for our example. Now that I’ve got my database set up, and my table and schema complete, let’s look at how I can start exposing some data in a way that’s easily consumed by a Windows 8 app. 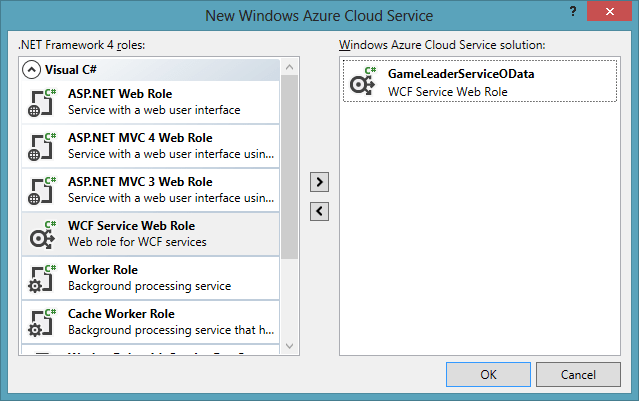 NOTE: This tutorial assumes that you have already installed the latest Windows Azure SDK. If you have not yet, then go here, and look for the “install the SDK” link near the top of the page, and follow the instructions to install the SDK. 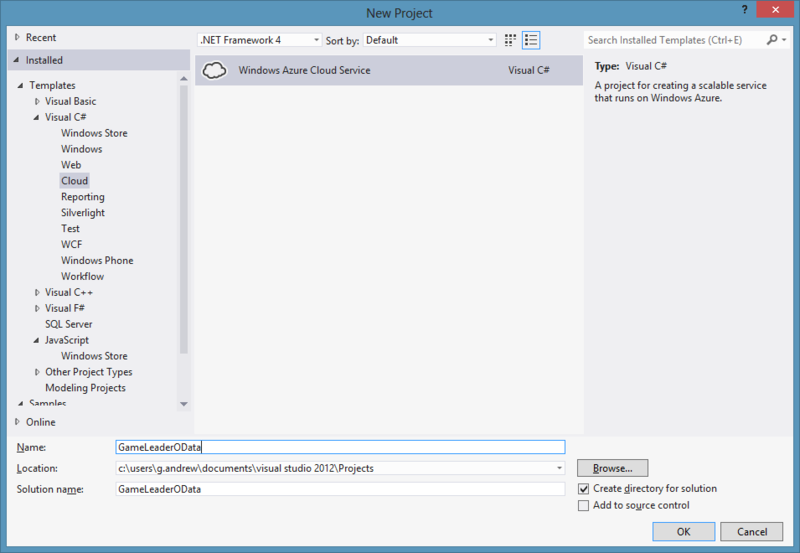 When the project has been created, Visual Studio will open up the default service code file, Services1.svc.cs. I don’t need this (because I’ll be adding my own service shortly), so I’ll close it, and delete both Service1.svc (and its code-behind file) as well as IService1.cs. 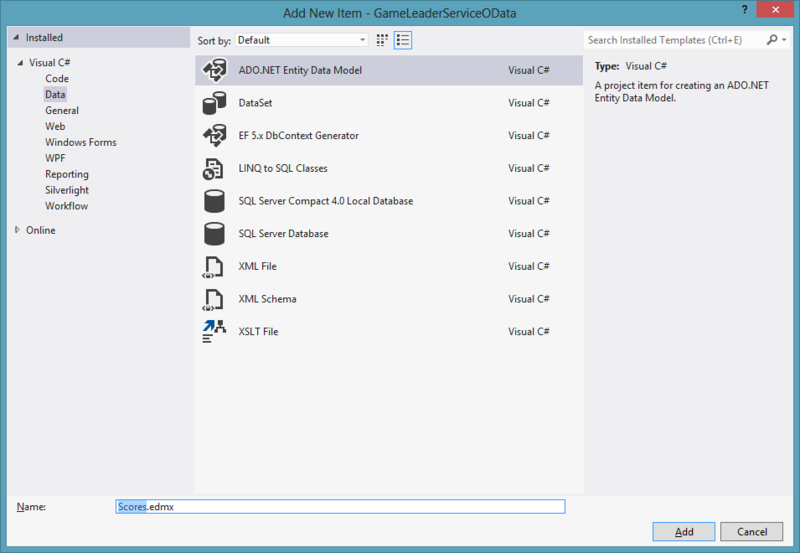 I’ll go ahead and select Generate from Database for the model contents, then choose New Connection for the database connection, and provide the connection information for my SQL Azure database created earlier. For simplicity’s sake, and because this is a demo rather than production code, I’m storing the password as part of the entity connection settings in web.config. IMPORTANT: You should always perform an evaluation of the security needs of your application, and make the best choices for the security of your connection settings, in particular passwords, which may include encryption, or setting connection passwords via code rather than storing in configuration files. The best practices for this are beyond the scope of this post, however. Once I click Finish, Visual Studio will create the data model, and open the model diagram, which contains the single entity, Score. Now that I’ve got a model, it’s time to wrap it up in a nice service. If you’re not already familiar with it, OData is the short name of the Open Data Protocol, a web protocol for querying and updating data. OData itself is simply a specification, while implementation may take different forms depending on the vendor supplying the implementation. 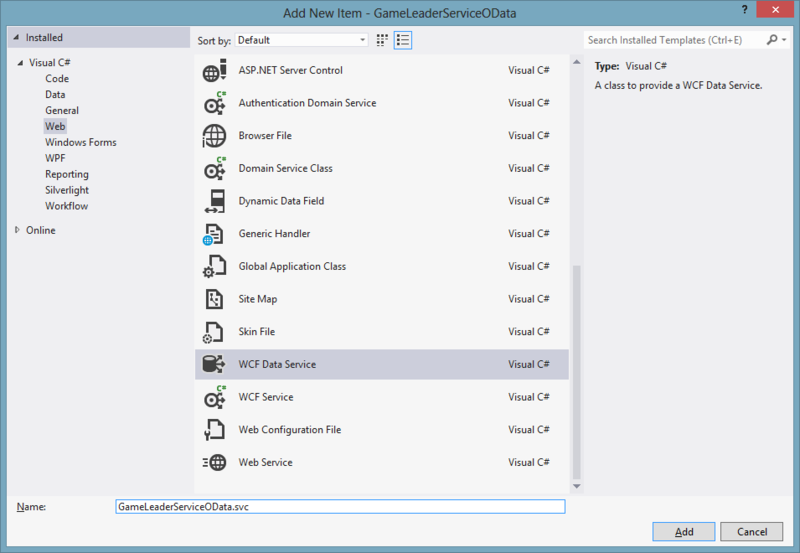 One of Microsoft’s implementations of the OData protocol is WCF Data Services (more recently, Microsoft added OData support to the ASP.NET Web API stack, which I’ll be looking at in a future post in this series). When I click Install, NuGet will add the WCF Data Services Server assemblies (along with any dependencies) to my project, add the required references, and then I’m good to go. NOTE: One important reason for updating to the latest version of WCF Data Services is that version 5.1 added support for the format query parameter, which allows you to specify that you want the service to return JSON-formatted data, rather than the default ATOM-Pub format. This is very useful in scenarios where you are unable to pass an HTTP header to specify the desired format, for example when you’re testing your service in a browser, or when using APIs that only allow you to pass a service URI as part of the API. In the class declaration, I need to provide the name of the data source class (in my case, this is the entity name from our data model, which is GameLeaderODataEntities). 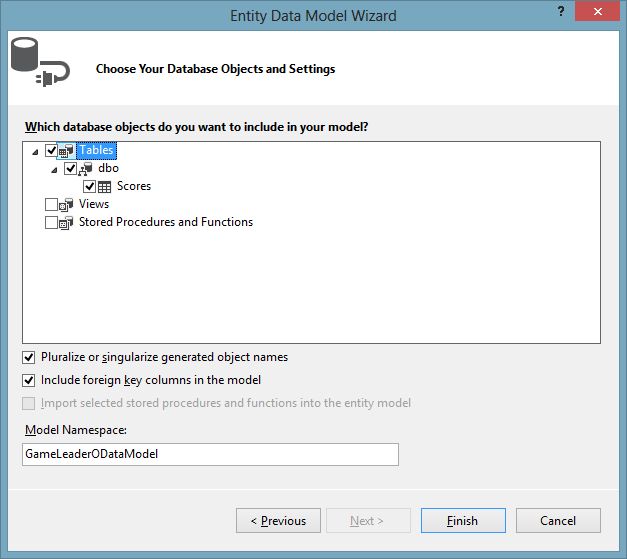 In the InitializeServiceMethod, I need to configure the access rules for the entity. In my case, I’m going to provide AllRead and AllWrite. Note that this step provides these permissions to anyone with the OData endpoint URL, so if you want to limit access to authenticated users, you also need to provide (either via configuration or code) for authentication in your solution. 5:          // This method is called only once to initialize service-wide policies. 8:              // TODO: set rules to indicate which entity sets and service operations are visible, updatable, etc. Note that because I updated the version of WCF Data Services using NuGet, I was getting an error in the IDE for DataServiceProtocolVersion.V3 on line 12. The issue was that the reference to the previous version of System.Data.Services.Client (which is included by default when I create a new service) was not removed by NuGet when an updated version was added. Removing the reference to System.Data.Services.Client fixed this issue. At this point, assuming I’ve provided all of the correct credentials, and I have data in my database, I should be ready to test my service. Note that while I’m debugging locally, my service does not need to connect to Windows Azure at all. 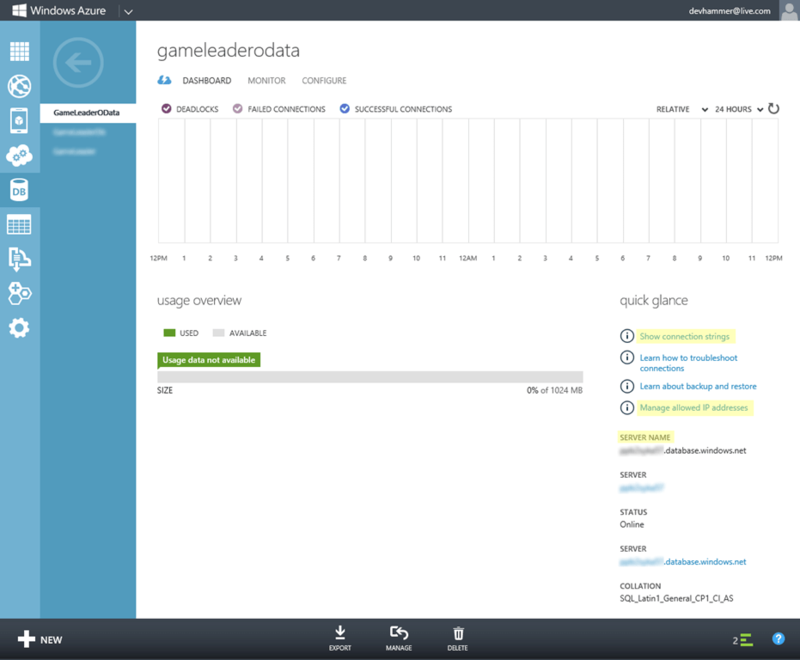 The Windows Azure SDK Tools provide everything I need to run the “cloud” right on my desktop. As you can see, my database has 3 records. One nice advantage of JSON is that it’s a very compact way of representing data, but you might have noticed that it doesn’t embed the metadata in the .js file. Note, however, that the JSON data includes a reference to the metadata URI, so clients interested in the metadata know where to find it. OData supports many more query parameters, which you can read about in the OData Protocol Documentation (of particular interest are the OData Core and URL Conventions docs). You should be able to expand the References section of the project in Solution Explorer, locate the reference, right-click it and remove. 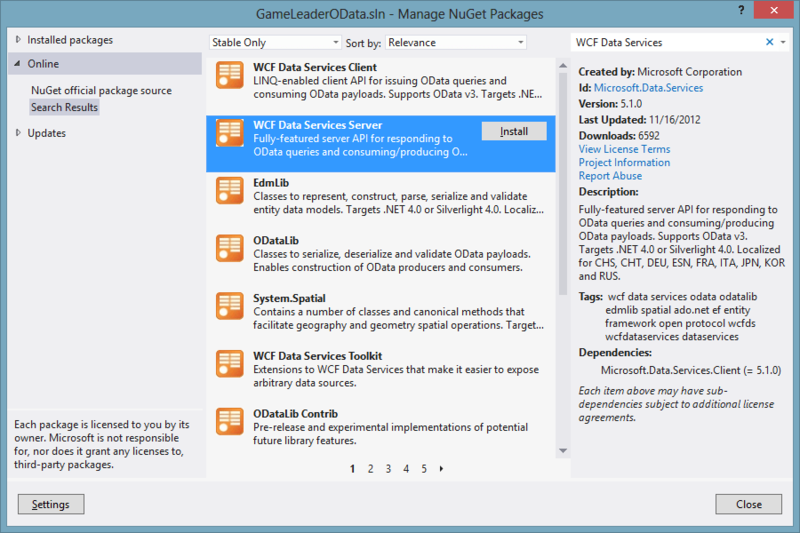 Then you can install the latest version via Nuget.